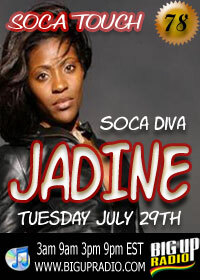 Bigupradio.com proudly presents the "Soca Diva " Jadine on this weeks Soca Touch hosted by The Golden Touch Crew. This week the beautiful Jadine stops by for an exclusive interview. Jadine is smashing up the soca arena worldwide. Don’t miss this exclusive interview with Jadine! The Golden Touch Crew is one of the well known sounds in the Maryland and DC area. They play a wide spectrum of music with more emphasis on Soca and Calypso which is the native music of their country of origin,Trinidad and Tobago. These three dj’s, Smally , Signal and Acid have come together to take the Bigupradio Sweet Soca listeners by storm, bringing the Soca, Calypso and Zouk flavor mainstream with authentic skills. Tune in every Tuesday 3am, 3pm, 9am & 9pm EST. There are many stars from the Caribbean but there is only one Jadine. Born Jadine Greenaway and hailing from the Emerald Isle of Montserrat, Jadine aka the Soca Deva first discovered her calling for soca music as a child, and has turned that passion into a successful career since 2004. "My mother has a beautiful voice and I used to sing with her, sometimes while driving in the car or cleaning the house on Sundays." In fact, it was her family who first discovered her star power, forcing her to sing at a relative’s wedding. Not surprising, today that potential is realized as the demand for a performance from the Soca Deva has spread throughout the Caribbean entertainment industry. Poised, passionate and driven, Jadine’s take on the soca is exceptional, as she blends the bluesy sounds of R&B into the genre, giving it that modern touch that is inherent of the songstress.